Alejandro Gonzalez Iñárritu accepts the Academy Award for best picture for Birdman. The rain that fell on Hollywood as the hours of red-carpet coverage wore on may have provided one of the evening's best visuals: actual people running around wearing plastic bags as they guided famous people out of limos, under umbrellas and to the waiting microphones of interviewers who wanted to know who made the dress, the shoes, the jewelry. It was literally the packing up and encasing of humanity to keep reality out: What could be more Oscars than that? Hopes were high for host Neil Patrick Harris, who has extensive experience at shows like the Tonys and Emmys, but who had the Oscar stage for the first time (in a year when he had a significant role in a significant film, David Fincher's Gone Girl). Oscar hosting is usually the most thankless of thankless tasks: The best-case scenario is that everyone says you were fine, and the worst-case scenario is that they're still talking 10 years later about how you bombed. Harris opened with a "Hollywood's best and whitest" joke in an effort to defuse the unavoidable fact that it was going to be a very white night of major nominees (a very male night, as well, in most of the categories in which it could be, though that's a separate thing), but he immediately turned away from it in what was probably a smart choice: He did a musical number. Billy Crystal used to do this too, but he didn't have NPH's Tony experience. The number relied heavily on green-screen stuff that can't have meant as much to people in the room, but it beat trying to come up with a joke about everyone in the room. Over the course of the night, Harris did a lot of intentionally awful puns (introducing Reese Witherspoon as an actress you could eat up ... with her spoon) and other cheap-date stuff (praising Channing Tatum as "the real deal, pants down — hands down"). He mostly avoided setup-punchline jokes, going for sillier wordplay and pretty much giving up on a traditional monologue. It's the kind of thing that can work, but when it deflates, it deflates a lot. The speeches can always be counted on, however, for some variety, and they got off to a feisty start as supporting actor winner J.K. Simmons of Whiplash decided to make the most of his platform and spent his (terrific) speech encouraging everyone to call their parents. Not because of acting; just because. But for a while, the tension seemed like it was going to come from a rare standoff between winners and the orchestra tasked with gently playing them off the stage so the whole thing isn't six hours long. Only a bit later, the directors of the winner for best documentary short, Crisis Hotline: Veterans Press 1, were speaking when they began to be played off as well. When one of them, Dana Perry, mentioned that her son had committed suicide, the orchestra sheepishly stopped again. For being so early in the show, this was a lot of awkwardness, and it set a strange tone of discomfort, particularly when Harris followed up with a semi-naughty "balls" joke about the pompoms on the shoulders of Perry's dress. Not the best timing, perhaps. It began to feel like a party that wasn't going well. Harris tried for some jokes at the expense of the spectacle at hand, like a reference to the items in the reported $160,000 gift bags some received, ending with: "And an armored car ride to safety when the revolution comes." But he seemed unable to do anything with the format except do what hosts have been doing at the Oscars for years: struggle to get to "doing okay," lucky to be dismissed as kind of dull. There were winners in a variety of categories that get less attention: The Oscar for visual effects went to the team from Christopher Nolan's Interstellar, a film that was released to enormous anticipation and hasn't had quite the impact some expected. Perhaps the most popular movie to win a major award was Big Hero 6, the winner of best animated feature. Over in documentary feature, the award went to Citzenfour, the film about Edward Snowden. Some expected sound and technical awards to go to American Sniper, but Whiplash won best sound mixing. Sound editing did, however, go to American Sniper's Alan Robert Murray and Bub Asman, who previously won for director Clint Eastwood's Letters From Iwo Jima. One of the bigger awards, film editing, went to the editor of Whiplash, which was by then putting on a pretty good show. And the only award anybody thought Selma had a real chance to win, it did win, for the song "Glory," just after a stirring performance from Common and John Legend. They followed with a speech citing current civil rights struggles, including voting rights and incarceration. Some things, of course, repeat year after year, like the need to remember those who have passed away. It was a nice In Memoriam segment (it used watercolor-style portraits rather than clips, but the clips are always so short that they hardly seem worth it, and many backstage folks don't get them anyway), mostly avoiding the weird "putting everyone in ascending order of fame" game. It mixed people like Lauren Bacall and Robin Williams in among sound designers and casting directors, which makes it feel less like a contest to see who's last. (That said: writer and director Mike Nichols.) And then Jennifer Hudson sang a song with a terrible sound mix that probably could have been omitted. It also seems there must always be one utterly unnecessary bit that comes when everyone is exhausted, and this year, it was a 50th anniversary tribute to The Sound Of Music that came almost three hours into the show, featuring Lady Gaga singing not one but several songs from it. While it was a cute idea and a neat chance to see an artist do something different, by then it was obvious that the show was running wildly long, and spending long minutes on a 50-year-old movie with one of the most familiar scores on earth was the kind of thing that makes people mutiny. (But it did end in the undeniably delightful experience of hearing Julie Andrews say, "My dear Lady Gaga." That, as they say, is something.) Andrews presented the Oscar for best original score to Alexandre Desplat for The Grand Budapest Hotel. 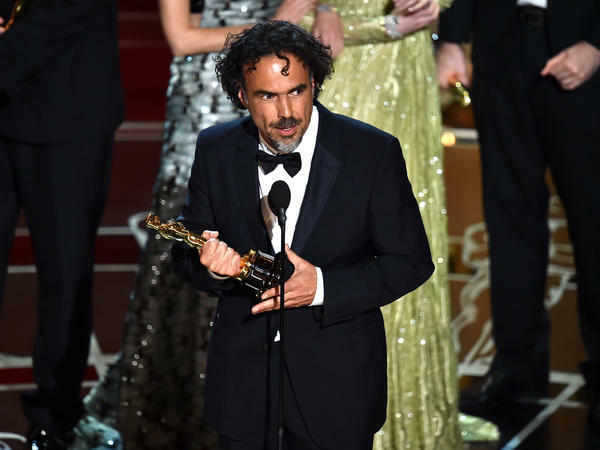 But the late sprint was for Alejandro Gonzalez Iñárritu's Birdman. It won for best original screenplay for Iñárritu himself and his collaborators Nicolás Giacobone, Alexander Dinelaris Jr. and Armando Bó. Best adapted screenplay went to Graham Moore for The Imitation Game (a film that was "adapted" from a book about Alan Turing, and quite liberally adapted from reality). The awards for best actor and best actress went where many expected: to Eddie Redmayne for The Theory Of Everything and to Julianne Moore for Still Alice. And then, the big moment: Birdman was named best picture. Presenter Sean Penn closed the night with one more unfortunate joke about who gave Iñárritu his green card (a joke that you might get away with if it weren't such a wretched year for diversity in both nominees and films), and it was time to go to bed. At the same time, it's a ceremony that feels more and more limited in its outlook rather than less and less. At a time when creative people are making exploratory stuff on the cheap, in new formats and with new distribution methods, the Oscars remain the same, offering best picture nominations to eight films, not one of which is about something other than the life of a man or a couple of men. Birdman is an offbeat film in many ways and has real visual inventiveness, but it also has hugely familiar themes: the lone struggling genius misunderstood by the world, yelling at his daughter about social media and defending the importance of real art. There are other stories, and there are other voices. The ceremony was dotted with people of color as presenters, performers and participants in comedy bits — Ejiofor, Oyelowo, Hudson, Zoe Saldana, Octavia Spencer, Lupita Nyong'o, even Eddie Murphy, among others. But it doesn't change who was up there being honored or even nominated, aside from Iñárritu — the second consecutive Latino director to win after Alfonso Cuarón last year — who joked that perhaps next year, there would be restrictions to prevent more wins by "two Mexicans in a row." It's certainly not only the lack of diversity that makes the Oscars seem irrelevant to the point of quaintness, but it's not helping. It may be that this is just a broken model. Perhaps it's time to look back at successful Emmy and Tony ceremonies that Harris has hosted and admit that if he struggles this much, either this is a crowd that's simply so puffed-up and joyless about this whole thing that there's no point in bringing in anyone who's any fun, or it's a show so inherently uninteresting that only the speeches need to even exist. Because it's either that or go back to Billy Crystal, and eventually there has to be a plan B that isn't that. How about this next year: no host at all, just presenters and speeches. No musical numbers, no montages (except, I suppose, In Memoriam). Because maybe if this guy can't make this format work, maybe people should stop taking this job.